Call it a reverse-Tristan Thompson, because Kendall Jenner is proving to the world that the NBA needs the Kardashians more than the Kardashians need the NBA. 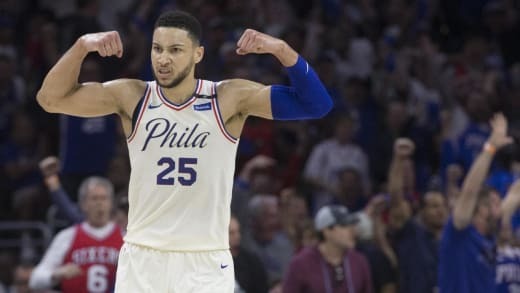 Okay, so Kendall isn’t technically a Kardashian, but she is dating Philadelphia 76ers standout Ben Simmons — and showing him that she’s not nearly as subservient in relationships as her beleaguered sister Khloe. Even though Ben and Kendall have been spending a lot of time together and were reportedly getting serious, she was recently photographed making out with Anwar Hadid, brother of Gigi and Bella Hadid. A source tells Radar Online that Simmons is aware of the pics and understandably not too happy about them. “Ben’s used to being a player on the court but feels Kendall stepped over him. He thinks she’s the true player!” claims the insider, who clearly harbors an abiding love for dad jokes. The source claims Ben was astonished when he first laid eyes on the images, as he was under the impression that he and Kendall were at the start of a serious relationship. The insider claims that Kendall has been giving Ben the cold shoulder in the days since the pics were first published. Simmons has reportedly been texting Kendall non-stop asking for an explanation, and she simply hasn’t replied. “He’s feeling extra salty over how Kendall did him,” says the source. We guess we can’t blame him on that score. If the situation really played out as it’s currently being reported, then Kendall certainly did Ben dirty. But as many have pointed out, this might be a classic case of instant karma. When he first started hooking up with Kendall, Ben was reportedly still dating singer Tinashe. It’s believed that he never really broke things off with her, and Tinashe learned her relationship was over by hearing reports that Ben was hooking up with Kendall. Add that to the rage she must be feeling over the news that Tristan Thompson cheated on Khloe Kardashian, and it’s not hard to see how Kendall might not be feeling much sympathy for Ben. Sure, Tristan and Ben aren’t the same person, and it doesn’t even seem that they’re friends. But lashing out is lashing out — and Kendall seems like a woman with a score to settle. Previous story Beyonce & Jay Z Renew Vows: Did He Get Caught Cheating Again? !